Monk: In terms of Charlotte, Bill Spoon’s Barbecue is pretty much the closest thing we have to a well-respected, old school barbecue joint. Since 1963, first Bill Spoon himself and now his grandson Steve Jr. has been cooking whole hog, eastern-style NC barbecue on South Blvd. Which in itself is a bit odd considering Charlotte is much closer to Lexington than it is to the eastern part of the state. 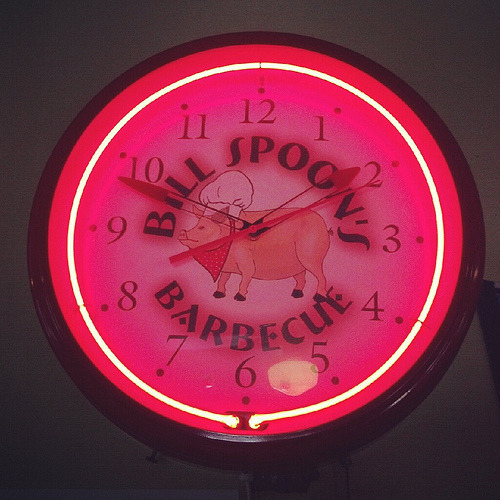 Nevertheless, despite having lived in Charlotte since 2005 and being well aware of this place, this past weekend was my first visit to Bill Spoon’s. Inside, it definitely looks the part of a proper barbecue joint with wood-paneled walls, white and yellow checked table cloths, and zero frills. Speedy: Bill Spoon’s has several things on the menu – chicken tenders, fried flounder, etc, but the only real barbecue items are the pulled pork (the signature dish) and the chicken. 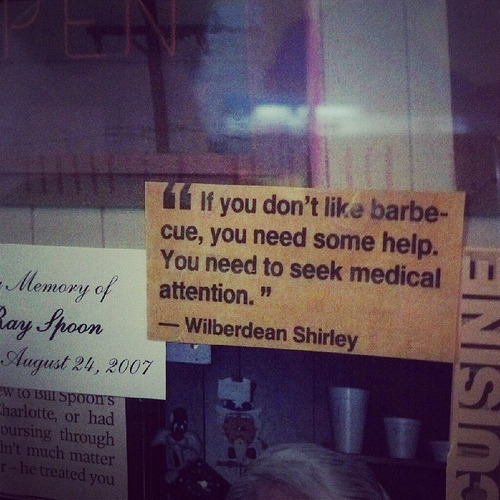 The restaurant is well respected in Charlotte, with people mentioning it frequently when barbecue comes up in conversation. Like Monk, I had not been despite living in the city for six years, even though it was always on my list of places to try. This sweltering Saturday seemed like as good a time as any. Monk: Mrs. Monk and I were a few minutes late but before we had arrived so the table could order, Speedy and our other friends had already gotten the first of several baskets of hush puppies (many times fresh out of the deep fryer). 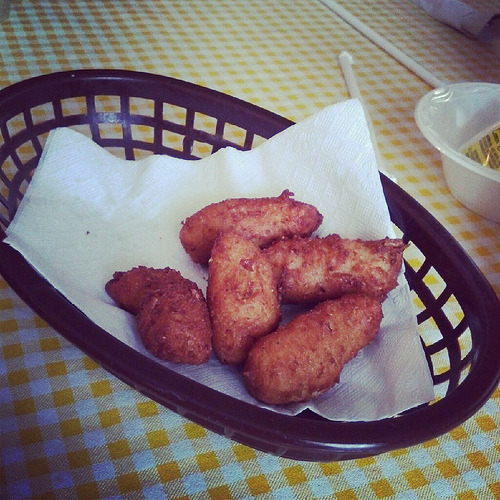 That’s right, bottomless made-from-scratch hush puppies – just say the word and they will bring you baskets on baskets on baskets. And that is definitely a beautiful thing – especially when they are as good as the ones here. Rudy: Whenever a place does this I first get excited…then I start to think they want me to fill up on these and distract me from the barbecue. Hopefully you were able to stay on track and get your fill on the meat. Monk: *pfft* Please, we aren’t amateurs here. Speedy: Bill Spoon’s cooks whole hog, which is different than my preferred shoulder-only sampling. 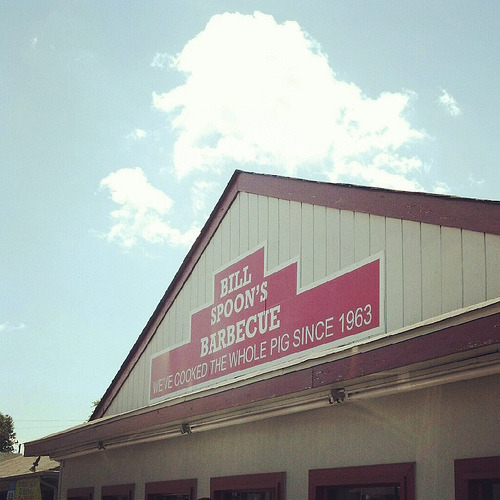 However, it’s hard to find too much to complain about when talking about the pork I was served at Bill Spoon’s. It had good flavor, was tender, and had a nice hint of smoke. Overall, I was pleased, though I’m not sure it lived up to some of the accolades I’ve heard from people in Charlotte (who obviously have not been to Lexington). Monk: The barbecue at Bill Spoon’s doesn’t necessarily need the eastern NC vinegar sauce found on each table, but as a good sauce should, it enhances the pork nicely. I agree that it had good smoke, no doubt attributable to the smokehouse out back. Monk: Bill Spoon’s is unique in that it actually serves a mustard-based slaw (with some vinegar), as opposed to the typical red vinegar slaw or white mayonnaise slaw. Our disdain for mustard sauce is well documented here, but this was the first time I had seen or even heard of a mustard slaw. I probably liked it a little more than Speedy, but we both agreed that it was better than mayonnaise slaw but not nearly as good as red slaw. Rudy: I don’t get why places feel they need to put their spin on something as basic as slaw. Just do it the way it’s always made and do it well. Speedy: The slaw confused me more than anything else. I thought it was OK, but I didn’t feel the need to finish it, like I do with a good red slaw. I wasn’t disappointed in the meal at all, but I feel if you focus your smoking on one item, you should do it really, really well. I don’t think that was the case here, even though the pork was good. If definitely does not supplant Midwood Smokehouse as my favorite ‘cue joint in Charlotte. Monk: For whatever reason, it took me over 7 years to make my first trip to Bill Spoon’s. Though I will always prefer Lexington style, with its solid, eastern NC barbecue I expect that it will be much, much sooner than 7 years for me to make a return trip. 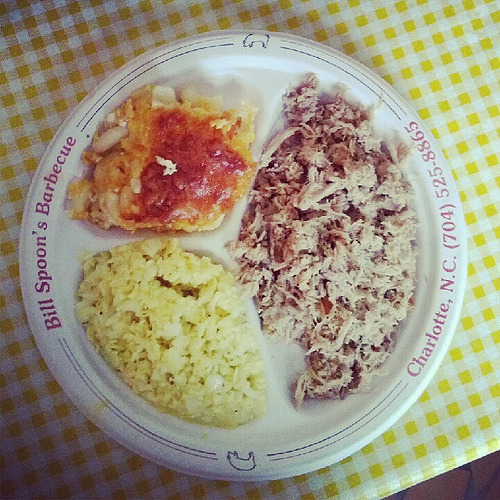 Pingback: Bill Spoon’s Barbecue, Charlotte NC (take two) – Marie, Let's Eat!